Simon’s Cat Pop Time is an addictive bubble matching game from Tactile games, creators of Crunch Time. You must help Chloe, Jazz, Maisy and our beloved Simons Cat teach a lesson to Mr. Potts who wants to get rid of kitties and critters. Match bubbles, discover new power-ups by feeding your favorite cats and defeat villains in this fun adventure game. There are several things to do, such as completing daily quests and achievements to get tickets and coins, and receiving bonuses via the VIC lounge. Bubble blasting was never this fun! 1. You will get 10 points for popping a bubble. You will have to match at least three bubbles of the same color to earn 30 points – the more the better. 2. 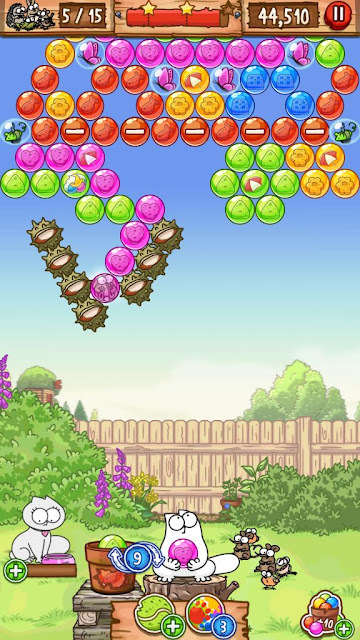 When you begin playing a level and clear the first few bubbles, your total points will be multiplied by 2. So if you match 3 bubbles, it will be 30×2=60 points. If you match 5, you will earn 100 points (50×2=100) and so on. Number 2 is the starter multiplier. 3. The multiplier increases by 1 each time you pop bubbles. So if you pop the next set of bubbles, your multiplier will be 3. To increase the multiplier and get mega combos, make sure you don’t break the chain. 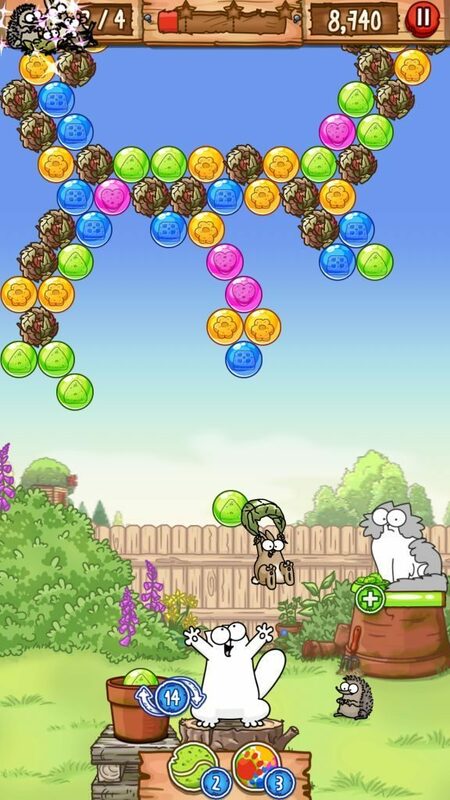 A series of consecutive bubble popping will help you earn more points. If you fail to match bubbles in the middle of a combo chain, the multiplier will reset to 2. 4. Each bubble that drops on the floor is worth 20 points. So don’t worry if a group of bubbies fall down, you will still earn some points. 5. A bubble with a trapped creature inside carries 500 points. 1. Scan the bubble hive to spot a large group of same colored bubbles and hit it. You will earn more points if the multiplier level is higher and the target group is accessible. You can also bank shots off the wall if they are difficult to reach. 2. Don’t miss out on trapped critter bubbles. They may be connected to same-colored bubbles. With a multiplier still active, you can get a lot of points if you match critter bubbles along with the normal ones. 3. Use power-ups to target a large hive of bubbles. The best way to make use of them is to combine two or three power-ups to clear several bubble at once. 4. The age-old bank shot trick works very well in Simon’s Cat Pop Time. All you have to do is hit the walls to bounce the shooter bubble off them to reach bubbles higher above the hive. Make sure you get the angle right. You can use the Owl Vision booster to extend the aiming line in case you want a more accurate shot. You will need coins to buy boosters. Complete daily quests and achievements to get coins. 5. You can use Jazz’s clockwork mouse to get rid of the top line of bubbles. This will make the bottom line fall down. You will earn 20 points per bubble that drops on the floor. However, I would recommend popping more number of bubbles in every move to increase the multiplier and earn more points. How do you clear the bubbles with bugs? What are the tickets used for you earn in the daily quest and how do you get to them? In Simon’s Cat Pop Time, tickets are used to play the bronze-silver-gold tournaments. Bronze tickets can be used to play the bronze tournament to get fabulous prizes, silver tickets for silver and so on. To unlock tournament, you will have to finish level 51. You can then tap calendar > tournament and use a ticket to play one. You can earn tickets from the daily tournament. You can also get them by completing certain achievements. Tap the trophy to get a list of achievements. I have reached level 1010. A note says there will be more levels available soon. When will that be? I do enjoy the game. The umbrella protects from Mr Potts water balloons not the minus bubbles. It’s only available when there are water balloons in play. Re: The umbrella – later in the game, water balloons are introduced. If you hit one, you get soaked and lose the level immediately. The umbrella protects you from those soaking you. How do you get rid of the chain of ants? You will have to get rid of the queen ant (she is wearing a crown) to clear a chain of ants. Launch a bubble that matches 3 or more bubbles linked to the queen ant bubble to remove her. Did you know you earn coins if you hit the bird as it flies by across the game ? Is there a way to predict when the bird will fly across the screen ? What does the umbrella do ? The bird appears randomly across the screen. You will receive 10 coins when you hit him.